It's been a busy ol' weekend, although in a nice and kind-of relaxing way. I started with my third ever appearance at parkrun, and I took a new risk - running without my ipod! I'm pleased to report that I survived the experience, although I did miss the music a bit. It wasn't a PB this time, but I'm blaming the extreme muddiness of parts of the course! (Have to have something to blame  ) At a few points it was more like iceskating than running! Then, after a good shower, I headed off for my treat: 24 hours in the New Forest - a beautiful part of the UK. I drove down through lanes of yellow and orange leaves, occasionally meeting a cow, pony or donkey on the verge or ambling across the road. I quickly checked into my hotel and headed out for an afternoon stroll. It's one of a series that we have used in various places (Lake District, Peak District, home counties) with plenty of success. 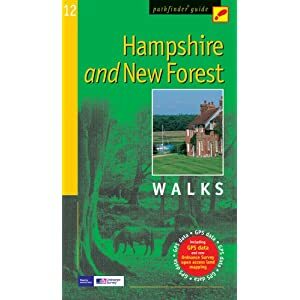 The walks are clearly colour-coded in difficulty, from a flat 1 1/2 hrs to a very hilly 4-5 hours, and easy to follow - much easier than some other walking books I have tried. That is a beautiful walk! I love it, would love love love to see it someday. Ah, cream tea! What a lovely way to end a nice walk in the Autumn.